﻿ Hoarding, Biohazard Cleanup Disaster Response In Seattle, Washington. Do you or a loved one suffer from hoarding or collecting excessively? Are you ready to take control of your life? Are you ready to take control of the stuff that’s been controlling you? 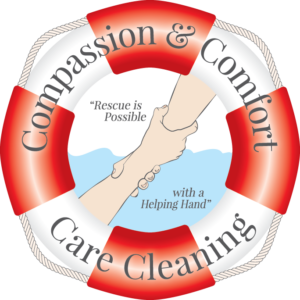 Please visit our sister company, Compassion & Comfort Care Cleaning. Theresa Borst is the owner of CCCC and has a team in place to ensure that you receive only the most compassionate assistance. All information is strictly confidential. Compassion & Comfort Care Cleaning won’t share any of your information with anyone, ever. They want to help you take control and sit in the driver’s seat of your own life. We serve Bellevue, Bellingham, Coupeville, Everett, Issaquah, Mount. Vernon, Olympia, Renton, Seattle, Tacoma and surrounding areas in Washington!